In 2011, the Center for Disease control and prevention announced that 20% of children in grades 9-12 have experienced bullying. Bullying is not just a mean comment on the playground but a serious offence that shouldn’t be taken lightly. Now, children of all ages have access to a cellphone and computer. Bullies can take this opportunity to tease another child relentlessly. Power: Children who bully use their power to harm others. Power can be strength, popularity or access to embarrassing information. Repetition: The behavior must occur on a regular basis. If you suspect your child is being bullied, contact your child’s teacher right away. Even though it might be difficult, stick to the facts without getting overly emotional or threatening. Be ready with factual information such as dates, times and names of the bully or bullies. If your child is accused of bullying others, take the accusations seriously. Don’t come up with excuses for your child. Don’t believe everything your child tells you; bullies can be good at manipulating adults. 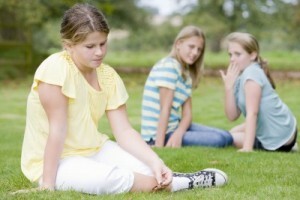 You should explore the reasons for your child’s bullying and seek professional help if necessary.